Industrial Head Protection Market size was above USD 2.3 billion in 2016 and expects volume consumption to surpass 400 million units by 2024. Rising influence on considering worker’s safety at high priority in mining, oil & gas, and construction industries should drive industrial head protection market size. It plays a vital role in working environment by safeguarding against low hanging objects, electric hazards, falling objects and accidental falls, making it beneficial for industrial injury safety programs. Global construction industry was estimated over USD 9 trillion in 2016 and is poised to surpass USD 16 trillion at the end of 2024. Construction industry registered over 995 fatalities due to brain injuries. Various fatalities include falls, electrocution, trench cave-ins, struck by objects, malfunctioning equipment like forklifts and cranes. High mortality rates accompanied with stringent policies and regulatory norms set to ensure worker’s safety should contribute towards product demand. U.S. mining industry accounts for over 7% of the fatal head injuries which has led to rise in awareness regarding workers health and safety. As per Industrial Safety and Health Department, falls are the largest cause of accidental deaths and accounted for over 55% of the total fatalities in 2016. Companies are adopting various regulations and safety guidelines to prevent hazards in the workplace and are offering solutions to minimize occupational injuries in pharmaceutical, chemical, oil & gas, transportation, mining and food manufacturing sectors, thereby driving industrial head protection market growth. Favorable regulations by OSHA under 29 CFR 1910. 135 (a) and 1910.135 (b), which makes it mandatory for the employer to ensure safety helmet usage in accident prone area, thereby promoting industrial head protection market size. Also, OSHA has set quality standards such as ANSI Z89.1-2009, Z89.1-2003 and Z89.1-1997 to ensure high equipment quality depending on hazard or workplace conditions. Major raw materials, polypropylene, polycarbonate, ABS, HDPE, polystyrene and polyethylene are used for production process. Raw material cost concerns owing to wide product usage in agriculture, electronics, construction and packaging industries may challenge industry profitability and affect industrial head protection market price trend. Acrylonitrile butadiene styrene (ABS) based industrial head protection market size may exceed USD 1.15 billion by 2024. It is used in type I safety helmets and hard hats for general industrial mining and construction applications. It provides toughness, impact resistance and electric insulation. Low cost and easy manufacturing process along with companies engaged in providing customized products with lamp holder mainly for mining industry is likely to stimulate industry growth. Fiberglass reinforced plastics (FRP) based industrial head protection equipment market may register gains at over 4.5% at the end of 2024. They are extensively used in high temperature workplace such as oil field drilling, forest cutting, construction, power supply line and metallurgy due to high heat resistance and electric insulation, thereby driving industry growth. Polycarbonate based industrial head protection equipment is mainly used in manufacturing safety helmets owing to its easy molding and electric resistance properties. Safety helmets & hard hats market size may surpass USD 3.3 billion in sales by 2024. These are head gears, designed to protect wearer from harsh weather, falling objects mainly in oil & gas, mining, forestry and construction industries which is likely to stimulate industrial head protection market size. Hard hats are classified in Type l and Type ll according to area of head that is to be protected. These hats are again categorized as Class G (general) and Class E (electrical) and Class C (conductive) according to protection they provide from electric hazards. Bump caps demand may witness gains at over 4%. Strong application outlook in painting, food processing, automotive, and sports industries may fuel product demand. It provides protection from flame and electric hazards along with low temperature applications. Industrial safety helmet market size from construction application is estimated to reach up to USD 880 million within the projected timeframe. High fatality rate in construction sector due to head injuries caused by falling & moving objects, collapse, trips & falls and height supported by strict regulatory compliances for workers safety may have a positive influence on product demand. Industrial head protection market share from oil & gas application may witness gains at over 4.5%. These industries are subjected to oil spills, explosion, falls which may lead to serious head injuries, thereby promoting industry growth. Industrial safety helmet market size from mining application may register close to 4.5%. It involves working in hazardous environment with heavy machinery and tools subjected to high risk from falling objects, mobile equipment accidents and falling rocks, which has led to rise in need for high quality safety equipment such as hard hats & helmets. China industrial head protection market size is poised to surpass USD 300 million in sale by 2024. Increase in construction spending accompanied with rapid industrialization has led to rise in various manufacturing industries, should drive regional industry growth. Germany industrial head protection market size may register gains close to 3%. Increasing demand for durable protection equipment from manufacturing industries due to occupational fatalities may propel regional growth. 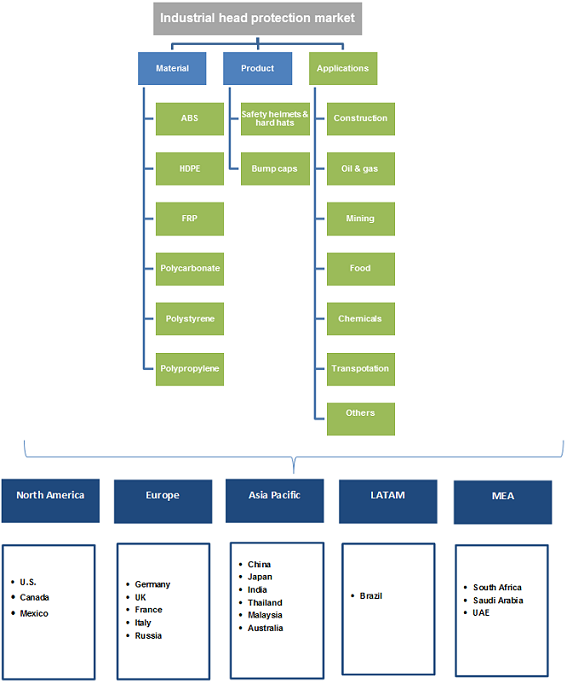 Brazil industrial head protection market may witness significant gains at over 5.5%. Favorable regulation regarding low taxation for the manufacturers having less number of workplace accidents has led to rise in investments in employee safety equipment which is likely to fuel product demand in the region. 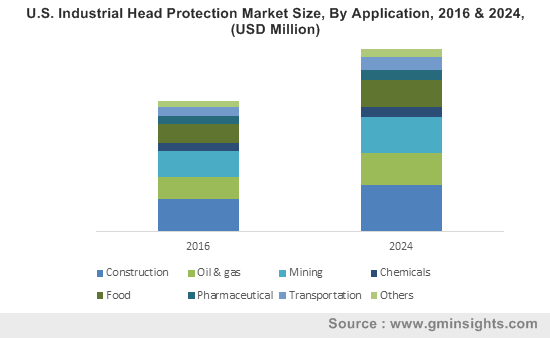 Global industrial head protection market share is moderately consolidated with key participants operating in this industry are 3M Company, Honeywell International, MSA Safety, Dupont. Other players in this market are Mallcom, Gateway Safety, UVEX Safety, Radians. Most of the manufacturers are providing customized products with sensors, face protection glass and night lamp holders to ensure safety to work comfortably. Companies are also investing in technological and product innovation to enhance their business presence and gain core competency, which is likely to contribute towards industry growth. Industrial head protection are safety equipment worn to reduce risk from work place hazards and protect fatal head injuries. They are designed in compliance with regulatory standards to protect from falls, moving & falling objects, trips and slips mainly in construction, oil & gas, food, chemical and mining sectors. Safety helmets and bump caps are widely used in these industries owing to increasing awareness regarding workplace safety and protective equipment, influencing industry growth. Strict government guidelines and framework in the U.S., Germany and the UK has led companies to follow certain guidelines and rules to avoid any form of occupational hazards.